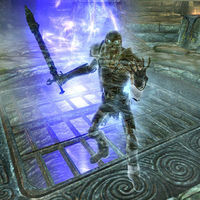 Halldir is a powerful draugr who can be found in Halldir's Cairn. He is a powerful mage and has been draining the life from anyone unfortunate enough to stray into his lair in order to preserve and eventually restore himself to full life. He carries a unique weapon, Halldir's Staff. During battle, when he loses a third of his health, he will disappear and split into three different elemental versions of himself. Once these versions are killed, his ghost materializes and can be defeated. The clones of Halldir disappear quickly: after around 5-10 seconds. After defeating Halldir, it is possible to obtain two of his staff. One is dropped, and the other can be found in his ash pile. If you kill Halldir with a sneak attack, his elemental ghosts may be invisible, and upon their defeat Halldir will reappear as a pile of ash. ? This page was last modified on 16 December 2018, at 23:28.